The most visible outer part, which is bottle shaped is known as the HOVEL and can be a variety of shapes and sizes, it can be up to seventy feet tall. The HOVEL acts as a chimney; taking away the smoke, creating air flow and protecting the oven inside from the weather and uneven draughts. The inner part is the kin proper. It is a round structure with a domed roof, the CROWN, and its wall are approximately one foot thick. A doorway, the CLAMMINS or WICKET, surrounded by a stout iron frame and just large enough for a man with a SAGGAR on his head to pass through , is built into the kiln. Around the base of the oven are FIREMOUTHS - the exact number depends on the size of the oven, - in which fires are let for the firing. Inside the oven directly above each FIREMOUTH is a BAG, this is a small firebrick chimney, the purpose of which is to direct the flames from the fires below into the oven and protect the SAGGARS nearby. 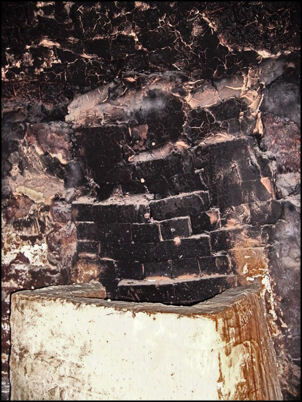 Underneath the floor of the kiln, FLUES, which lead from each FIREMOUTH, distribute heat throughout the interior. 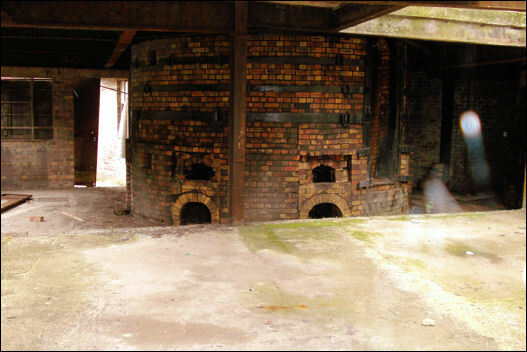 In the centre of the kiln floor is the WELL HOLE over which SAGGARS, with their bottoms knocked out, are placed. This forms a chimney to allow the smoke to escape. This is the PIPE BUNG. 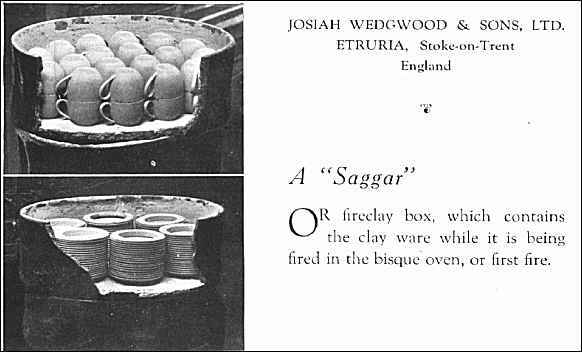 The ware to be fired was first arranged in fireclay boxes called SAGGARS which were then placed inside the oven. using saggars to protect the ware. 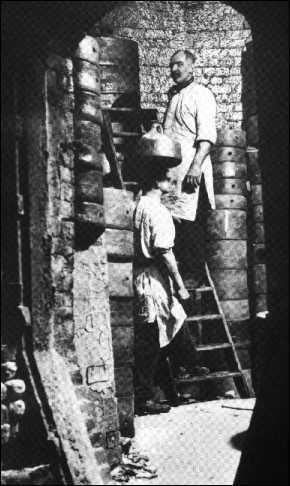 The SAGGARS were arranged in vertical stacks called BUNGS which extended from the floor of the oven to the ceiling. 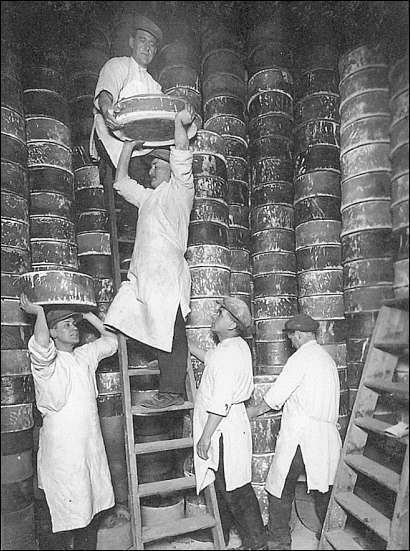 When they were full, the SAGGARS were carried into the oven by PLACERS, who balanced them on their shoulders and heads. The weight of a full SAGGAR was approximately half a hundred weight. To protect their heads and to keep the SAGGARS in place, the PLACERS wore rolls made from old stockings which were wedged into the front of each man's cap. 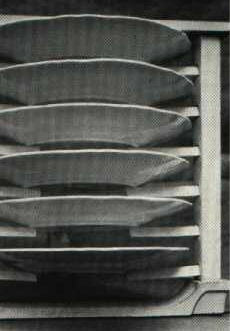 Ware was arranged differently in the SAGGARS, according to whether it was BISCUITWARE (all pottery after its first firing) or GLOSTWARE (ware in the process of being glazed). For HOLLOWARE (for example, cups bowls, jugs and vases), the bottom of each SAGGAR was covered with a thin layer of powdered flint or silica sand, and as many pieces as possible were then packed in. FLATWARE( for example, dishes, plates and saucers) was BEDDED. A layer of ware was placed on top of a layer of silica sand or powdered flint and was covered with another layer of sand and flint. On top of this was placed yet another layer of ware which in its turn was covered with a layer of sand or flint. This continued until the SAGGAR had been filled with alternate layers of sand or flint and ware. The purpose of this method was to reduce warping. It was necessary to separate all the pieces so that during the firing when the glaze melted, they would not fuse together. 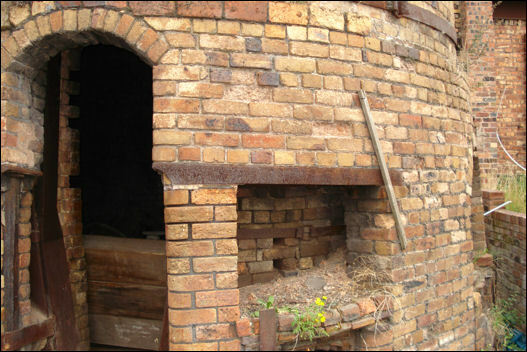 To separate the ware in the SAGGARS, different sorts of kiln furniture were used. This included PINS, SADDLES, THIMBLES and SPURS. 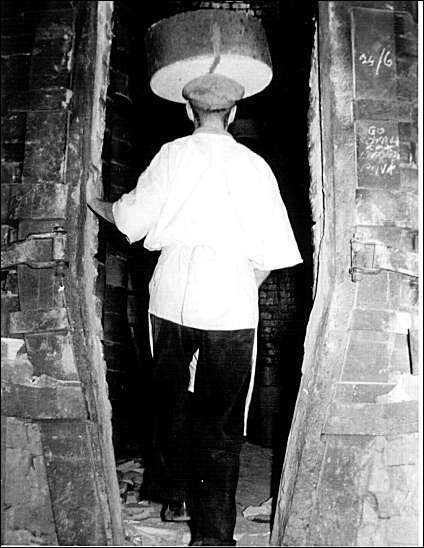 Inside the oven, the SAGGARS were stacked from floor to ceiling, in BUNGS. Starting at the rear of the oven, the BUNGS were SET-IN from the walls towards the centre. 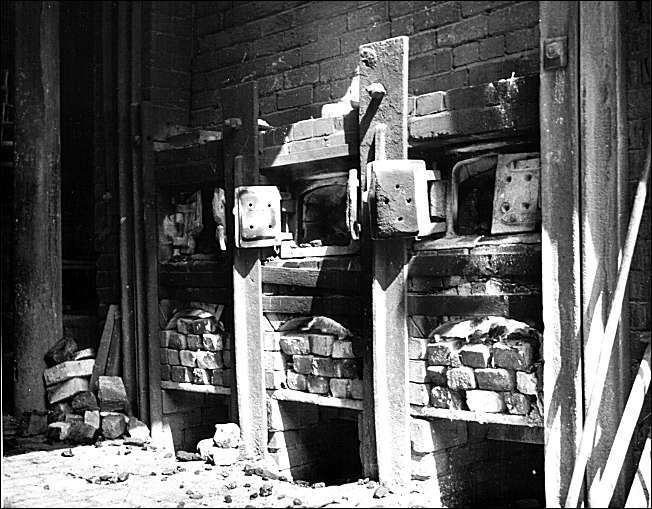 The PLACERS gradually worked their way around the ovens towards the CLAMMINS (door) and in the last section the BUNGS were set from the centre towards the door until the oven was full. Because the floor of the oven was sloping, the heavy BUNGS had to be wedged with pieces of broken SAGGAR, to enable them to stand upright. Because the temperatures within the oven varied widely, it was necessary to place the different types of ware in carefully selected locations. ...... "Terribly skilled jobs, you see. If the smoke got in it, it was all up with the ware inside, you see. Sulphur and all sorts of stuff out of the coal would disfigure that"
On average, the bottle ovens were fired once a week. 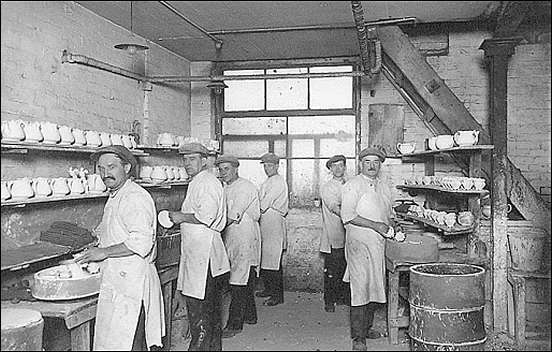 A BISCUIT (first) firing took three days and a GLOST (second) firing took two days. 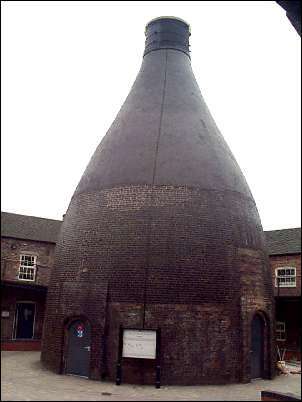 It required about fifteen tons of coal to fire one bottle oven once, and almost half the heat generated would go up the bottle shaped chimney as smoke. "It's a fine day if you can see the other side of the road"
The smoke, emerging sixty feet up, would eddy and curl down onto the buildings and street, even entering workshops and houses through ill-fitting windows and half open doors, so that the air became terribly polluted. 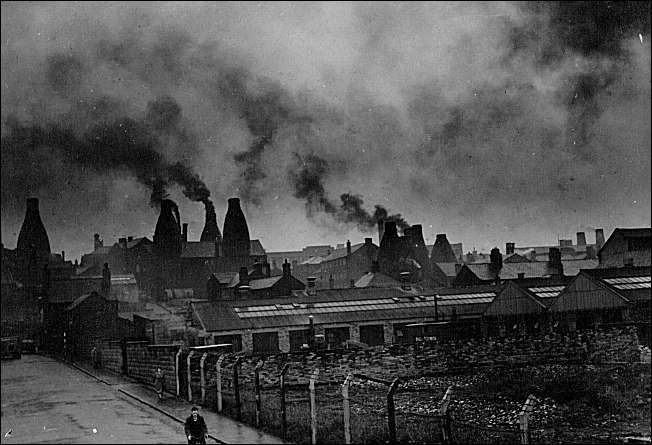 In Longton the town with the greatest number of bottle ovens, it used to be said, "It's a fine day if you can see the other side of the road", and when the bottle ovens were firing it was almost impossible to see your hand held in front of your face. 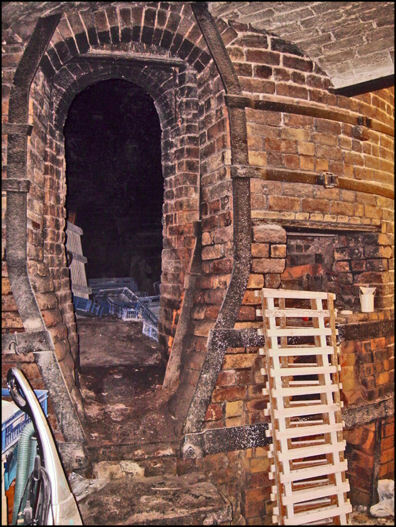 After placing the CLAMMINS (the entrance to the oven) was blocked up with bricks and sand and the oven was then ready to fire. Fires were let in the FIREMOUTHS and BATTED - that is, coal was loaded onto the fires - at intervals of about four hours. 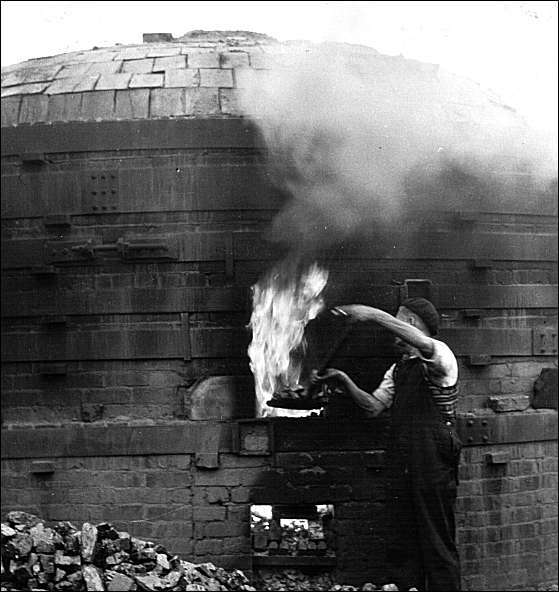 In the early stages of firing the temperature was kept low while the moisture in the ware was driven out. This was known as SMOKING . After about 48 hours, the maximum temperature (between 1000� C and 1250� C) was achieved and this was maintained for approximately two to three hours. The fires were then left to go out. Fine control of the draught was achieved by altering the position of the DAMPERS in the CROWN. DAMPERS are flaps made from iron and firebrick, which the fireman could operate from ground level by means of a pulley system. By opening selected DAMPERS, the draught in different sections of the oven could be increased, thus causing the fires to burn more fiercely and raising the temperature. By closing the DAMPERS the temperature could be kept steady or lowered. When the firing was over, the CLAMMINS was broken down and the oven left to cool. As soon as it was sufficiently cool for a man to enter without being harmed by the heat, the oven was emptied or drawn. 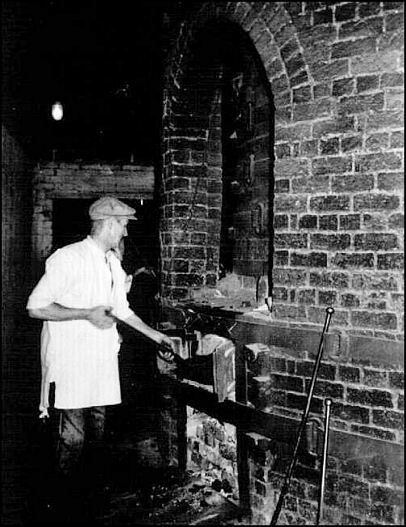 There is evidence that men often had to enter ovens which were too hot, because the factory owner required the ware urgently. In such cases, to protect themselves to some extent, the men wore wet rags over their hands and faces. "You'd let your fire out on your ovens and you were supposed to wait forty eight hours until It 'd go cool - ours used to be opened after twenty four hours and it would still be red hot inside it. Then men would climb on inside and they used to have five overcoats on and about three jackets wrapped around their wrists, and he'd have to lift the saggars down with his padded arms ".